Recently, I conducted an elaborate chicken nugget taste test for this here website, which involved diving into the several grocery stores’ frozen-food sections. As I did so, I was bemused by the multitude of tender and nugget varieties. My assignment was clearly nuggets. But why were there all these other options? Was it just about shape, or which part of the chicken the meat actually comes from? Or is it all just marketing? Then Marcy sent me the following from the USDA FSIS Standards and Labeling Policy Book, which I believe now makes me a leading expert on chicken nuggets versus tenders. According to the USDA: “Nuggets are irregularly shaped, usually bite-sized meat and/or poultry products which are usually breaded and deep fat fried and intended to be used as finger foods.” They come in a variety of different categories. They can be made from a solid piece of poultry; from “chopped and formed meat or poultry” (necessitating a qualifier like “Chicken Nugget, Chopped and Formed”; or “from chopped meat or poultry and containing binders, extenders and/or water,” which may then use the term nugget with a qualifier like “Breaded Nugget-Shaped Chicken Patties.” I’m going to be examining all those frozen grocery bags even more closely on my next shopping trip. The National Chicken Council tries to clear this all up on its website, along with explaining the ubiquitous “rib meat.” It says most nuggets “start as a split breast of chicken. You might read on the package that the product contains ‘rib meat.’” The council says this is not an additive or filler, just a natural extension of the breast meat, and other boneless chicken meat (from the legs and thighs, the NCC points out), could also be added for “flavor and texture.” To that end, the meat might also be marinated, and breaded. Tenders are a bit simpler under the USDA, as the term refers to “any strip of breast meat from the kind of poultry designated,” often also breaded. So there you go. 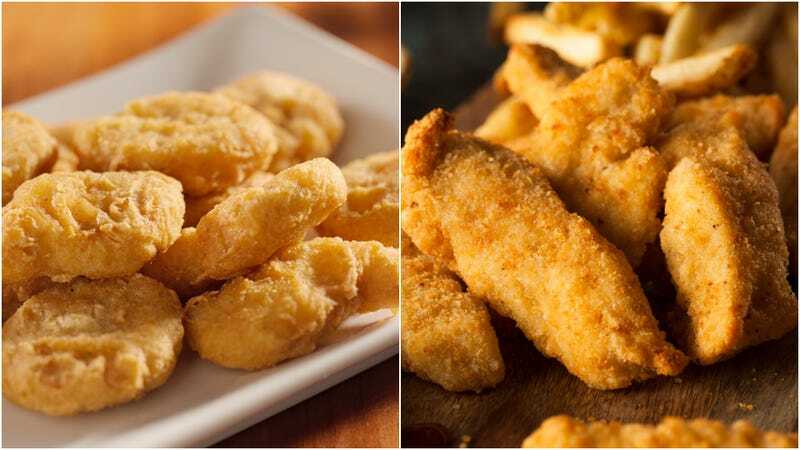 While primarily breast meat, nuggets can be made from chopped and formed from different parts of the chicken, while tenders are solid strips of poultry breast meat. Kyle Zimmerman, vice-president of Harrison’s Poultry Farm in Glenview, Illinois confirmed all my findings. He says that nuggets are “usually the jumbo size breast meat cut into chunks” from “huge factory farms and pumped full of water.” The tender, though, is “naturally occurring part of the chicken breast, the most tender part,” hence the name. It’s a “strip you can just grab,” especially if you’re Zimmerman, who is also a butcher. I wish I’d discovered all this before I stocked my freezer with a dozen chicken nugget bags. Still, I will serve Tyson, Trader Joe’s, Perdue et al. nuggets, because with that much ketchup, my kids will never know the difference anyway.